They’re the visionaries behind the stunning headpieces that are synonymous with our global sporting event. Here, writer Sarabeth Floyd offers a peek into their mysterious art and the sometimes-punishing hours they devote to dressing the rest of us for Derby. I have a degree in Fashion Design and made costumes for Cirque du Soleil, movies, commercials, the Joffrey Ballet and even a Grammy dress for Margaret Cho. When I lived in Chicago, I met a milliner who was visiting from NY. She talked about blocking, which is the molding hat process over wooden forms. I ended up going to Australia to do an apprenticeship and since I knew how to hand sew, the technique came naturally to me. At that point, I decided to switch careers. Tell us about your design philosophy and aesthetic. I do not sketch my ideas, mainly because I cannot draw. My philosophy is actually very similar to how I created costumes. I work with the material in my hands and guide it to what it wants to become. The creation of my hats needs to feel natural and not forced. I also take great pride in the old hat blocks and trims that I use. When creating a hat, I often think about the many hands that used these blocks 100-years-ago, or the handmade trims from France in the 1920s that I use. Can you describe your Derby season? My Derby starts for the following year when Derby ends. I collaborate with companies to create exclusive collections, for instance, Vineyard Vines. As soon as Derby is over, I am already working on samples to send them for the following Derby. The collection I create for Vineyard Vines includes 1000 fascinators and takes 4-5 months to complete. Many clients like to plan ahead. They typically entertain customers coming to town and therefore, will be wearing multiple outfits and hats for the occasion. I also collaborate with corporations from around the world that will be coming to Derby as a group. I provide their custom hat experience. The planning for these experiences typically starts in August for the following Derby. It takes approximately five days to create one hat. So, I am very busy all year around. What’s the secret to finding the perfect hat? It’s important for the hat or fascinator to be comfortable and to fit properly. You will be wearing the hat for many hours. The hat should also complement your physique. What’s the biggest Derby hat “Don’t”? When it comes to wearing fascinators with an elastic, it does not go under your chin! The elastic should fit comfortably behind your ears, under your hair. What’s your best Derby style advice? Keep your outfit simple in style and print. Your hat should be your statement piece. How important are hats to the Derby and to our identity asa city? Hats have been a staple of the Derby since the 1800s, when the first Derby took place. It is thought to bring good luck. People from all over the world come to Derby and it’s often on people’s bucket lists. The Derby is a huge event for our town and I say, let’s embrace the festivities and wear hats! What’s your most memorable millinery moment? A few years ago, I was featured on NBC Sports with Bob Costas. They came to my hat shop and filmed me making a hat and played it during Oaks and Derby. It was a proud moment for me to represent the millinery industry. Where can people buy your hats? About 30 years ago, customers began coming to Dee’s looking for Derby hats, so we rose to the demand and began carrying specific items to create them. Since the demand has grown every year, we have to source some of our base hats and fascinators, that we then trim to our customer’s specifications. We strive to source quality hats and unique products customers can’t find anywhere else. We try to provide our customers with new ideas every year as well as instructions for them to create their own hats at a reasonable price point. 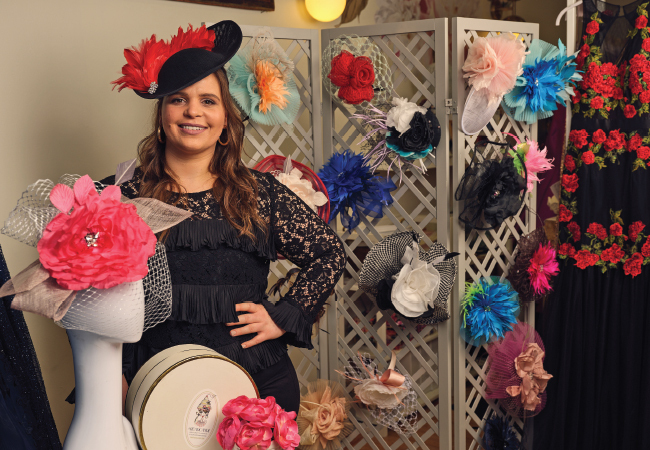 The hunt for the best Derby hat and fascinator bases as well as adornments starts in June, almost a year before the races, and continues all year long. Locals typically begin coming in to place their orders starting in February, out-of-towners start a little earlier in January for online orders. Dee’s hires extra staff just for the busy months of March and April. We have an eight-person design team creating the hats and beginning April 1, those ladies work everyday, all day until Oaks Day. The secret for finding the perfect Derby hat is all in fitting your style and comfort. Buy your dress first and bring it in when you come to place your order. Picking a hat that is too matchy-matchy or one that is uncomfortable. Both are going to make for a long day. How important are hats to the Derby? The Derby is more than just a “two-minute horse race”, it is a social event that includes dressing up, fashion, specialty drinks and traditions—traditions that go back to the very first Derby. After 145 years, the Derby is still a big part of our Louisville identity. In 2018, Dee’s created custom fascinators with Chili’s Restaurant to celebrate the Royal wedding of Harry and Megan. What will you be doing Derby day? Most of the staff, like myself, will be sleeping in and catching up on life beyond hats. However, we are open 10am-2pm for those last-minute pickups and touch-ups. You’d be surprised how many people land in the morning and come straight to Dee’s on their way to the track. Where can customers find your hats? We have thousands of hats ready to go, both designer and pre-adorned, in the store beginning in February. They are also on our website www.deeshats.com, if you want to see a preview before you come in the store or live out of town and want to order over the phone. Our price range is very wide, but custom fascinators and hats range from $100.00 and up. How did you become milliners? The millinery journey began with us in 2011, when we made our first hats together to attend the Derby. We created these wild hats made out of hair-weave that attracted so much attention from Derby-goers, that we had to continue the themed tradition the next year. While together in the Manhattan garment district months later, we had a crazy idea to start a seasonal Derby hat business. We both share a love of fashion and creating, and Kate had a degree in Fashion Design, so it seemed like a no-brainer. We officially started the business in 2013 in Kate's grandmother's dining room, spent three years in Rachel's dad's basement, and in our fifth year of business we had the opportunity to open our own hat shop. Rachel interned at a family-owned millinery business in Brooklyn for a year where she learned the hat-blocking process in-depth, and most of our other millinery skills have been self-taught from online classes. I'd say the most important part of our aesthetic is staying true to ourselves and our brand's personal style. We have learned over the years to cater to our clients’ needs in order to keep the business growing, but it’s very important for us to stay original. It's a huge compliment to us when people tell us they can spot a "Hat Girls" design. Try on as many shapes and styles as possible! It's shocking how many people come into our hat shop with a specific style in mind, and then after we convince them to try several other styles, they almost always find something they like better. What’s the biggest Derby hat “Do”? That's pretty simple: Go bold and step outside of your comfort zone. Whether it's wearing a new color, a fascinator for the first time, or a larger brim than you're used to, just do it. How important are hats to the Derby and to our identity as a city? When the Derby comes to mind, we think of three things: hats, bourbon, and horses. When traveling outside of Louisville and mentioning the Derby, the first question is always something about the hats. Is there anything you wish you’d see more of in terms of Derby style? We definitely find the most joy in our one-of-a-kind, fashion-forward, unexpected designs. Originality is very important to us. Having Salt-N-Pepa and Spinderella wear our hats together to the 2018 Derby! We loved their music growing up in the 90s, so that was really fun for us—and their personalities match our brand. The second most memorable millinery moment would be when our client from California had a horse running in the Queen Mary Stakes at the Royal Ascot in 2017. Her horse, Lady Aurelia, won the race so she and her family were on stage for the trophy presentation wearing our hat designs, standing right next to Prince William and Duchess Kate. Most likely making our hats the morning of, heading to the track early afternoon and placing some bets—and mingling with all our amazing clients. That's the best part of the event for us, seeing our hard work being proudly worn throughout Churchill Downs. Customers can visit us at our hat shop in Norton Commons, where we carry over 350 unique pieces, shop our full inventory online 24/7 at www.thehatgirls.com, Rodeo Drive boutique in Holiday Manor, Circe/Swag boutique in Chenoweth Plaza, and a few other boutiques in Lexington. We are also excited to announce that we'll be selling in Oxmoor Mall the last two weekends of April, and at the Aloft Hotel downtown on Main Street, the week of Derby. Our piece’s range from $148 to $1,200, with the average price being around $400, depending on whether the piece is ready-to-wear or a custom design. I moved to Chicago after high school all set to be a fashion designer. Once there, I discovered how many different avenues the fashion world encompasses. 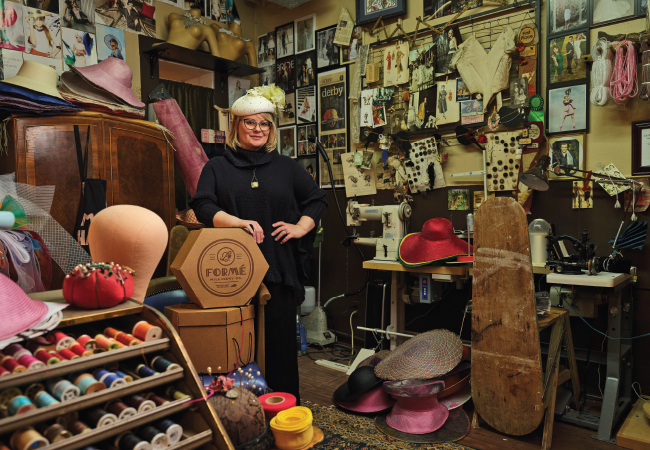 I worked for a milliner named Linda Campisano, and fell in the love with the craft. I decided to focus on millinery in design school and began coming home to Southern Indiana to create hats for my parents' friends out of their home. I moved to NYC and worked for another milliner there where I gained experience in the ready-to-wear field. I'm a three-color girl and I like to add layers to my hats and fascinators. I feel out my client's personality and get creative with all sorts of materials. Derby season never really stops but it begins in earnest in January with pricing, photo shoots, ordering, website work, store delivery, meeting with customers, etc. Around March, it begins to get crazy. I work best under pressure and though I try to get up early to begin my work day, I often find myself working late into the night, too. Find something that makes you feel comfortable and confident while wearing. Choose something fun and beautiful but also something that is practical for a long day at the track. Go vertical as opposed to wide. This works best for crowded boxes that inevitably end up housing more than the allotted guests. So, important! 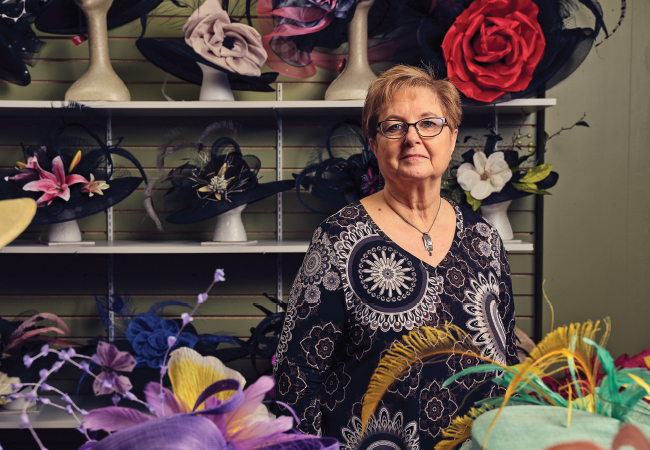 Hats, and now fascinators, are a part of Kentucky's history. They are important icons of the Derby. I'd love to see more European styles with cleaner lines, monochromatic color schemes, and an overall more architectural style that flows well. Designing a hat for Caroline Bryan, whose shirtless husband, Luke Bryan, came into the room while I was making some last-minute adjustments to her hat! What will you be doing on Derby day?